Howdy judges, welcome to another installment of Judge of the Week. 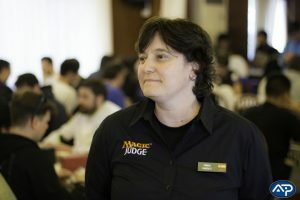 This week we feature a Spanish judge who is bringing diversity and lots of smiles to her part of the Magic community. Lets jump right in and get to know more about Monica Gonzalez! Favorite format: Booster Draft. I love Limited, I think it’s the most complete format. Favorite non-Magic Game: I love playing Mus, a Spanish game played with traditional playing cards. Best Tournament Result: I have won Prereleases and Game Days, and made Day 2 at a couple of GPs. Random fact about yourself: I’m a big fan of comic books and fantasy and science fiction books. In fact, I write articles for blogs on the subject. I have a large collection of European comics, including some valuable books. Books and comics are always competing with Magic cards for space on my shelves. This actually happened to another judge during a tournament we were judging together. A player called for a judge and told him “I played a Chains of Mephistopheles, and my opponent discarded a card and then drew”. My friend said, “OK, and?…”, the player replied, “and that isn’t what this card does!”. He was like “yes, it is”, but the player wouldn’t accept it. He showed him the Oracle text for the card, the player read it and said “this isn’t correct.” My friend, puzzled, asked “the Oracle text is not correct?”, and the player insisted “no, it’s not”. So, he asked the obvious question: “do you want to appeal the Oracle text for Chains of Mephistopheles to the Head Judge?”. The player simply replied “yes, please”. In 1993 and I had a scholarship at an American University for 2 months. A classmate invited me to play “a new card game that had just come out.” It got me hooked. I spent almost all the money I had on boosters of Unlimited. 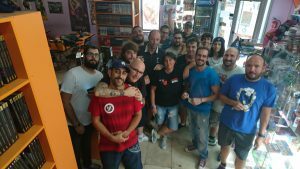 When I returned to Spain I looked for people to play and now I get goosebumps remembering that I used to play my dual lands and moxen without sleeves. But life takes many turns, and for family and professional reasons I left Magic in Fifth Edition and did not return until Return to Ravnica. I love what it has become: a big game and a great community all over the world. I have discovered that the search for excellence and the hard work is always worth it and is something to keep in mind in my non-Magic life. This behavior is a perfect way to improve and become a better person. The most important thing is that I am discovering many wonderful people that I hope will be great friends for the rest of my life. Of course, now I have way less free time. I still have a lot to do and learn, so I can’t stop now. I really enjoy judging and working with other judges in and out of tournaments. I think that right now judging is the best way I can contribute to the Magic community. Enjoy judging. It’s not a job, it’s something we do for fun, and if judges are having a good time during the tournament, players will have a better gaming experience. The diversity. At my LGS there are almost as many immigrants as natives and the way we all relate to each other is fantastic. Everybody is welcomed, wherever they come from, and everyone helps the everyone. The atmosphere is excellent and we have managed to create a great family. The only thing that gives me grief is that there are still too few women playing, but little by little we are getting more. I have a lot of hobbies, I play various sports, I love to travel, and go to the movies. I’m a geocacher and, of course, I enjoy video games. My favorite hobby is reading. A perfect afternoon is to enjoy a good book and a glass of good wine listening to good music. The conferences! 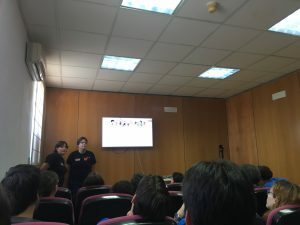 Not the seminars or the role-playing, but the moments with the community. Moments after having dinner when we get together to chat and meet. When we laugh so much that our jaw hurts and when we really learn to know each other. It can be just talking, or playing Pokémon Go or board games. The important thing is that we are together. 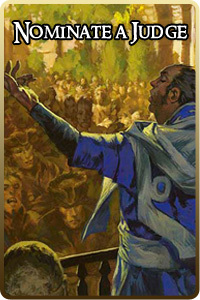 What’s your favorite Magic event that you’ve judged? 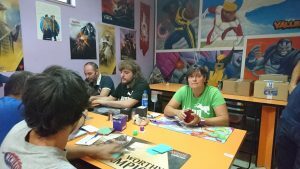 It is a true Magic party, and one of the best opportunities we have in Spain to learn how to work at big tournaments. The judge program reinforces many of my skills, both social and professional. I think it’s a well designed system to prepare judges, not just for tournaments, but for everyday life by making us more efficient and responsible. The feedback system is so valuable that I’m starting to use it in the projects I lead for my company, with very good results. Ursula K. Le Guin. If you don’t know her, hurry up and pick one of her excellent books. She is a famous writer, and has received many awards: Hugo, Nebula, National Book Award, PEN-Malamud, and more. She is well known for how she treats gender and diversity in her novels. Her first major science-fiction work, The Left Hand of Darkness (1969), is considered key in her field, for her radical research on gender roles, and for her moral and literary complexity. Since I discovered her books many years ago, I wanted to meet her and talk to her for a while. I consider her one of the most influential writers of our time and I would love her to tell me how she has faced her life and career, how she has managed to create those worlds in which reflect us and from which we learn so many things. I suppose I would play more sports and travel more with my family. I would surely miss something, even if I didn’t know what that something was. I love to judge, so it’s very easy for me to have fun during events. 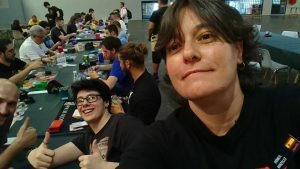 I like to talk to players and judges, about cards and decks or about things that are happening at the event. There’s always time to tell stories about fun rulings. I also make jokes and try to get smiles from those around me. If you were a Planeswalker what would your ultimate be? I am a strong advocate that diversity is good for the game, so my ultimate would be about it. Search your library for up to 5 creatures that don’t share a creature type between them or with creatures you control, and put them on the battlefield, then shuffle your library. You gain 2 life for each creature type among creatures you control. Monica deals damage to each opponent equal to the life gained this way. I love Zombies, but I think I am more like a Rogue, with a lot of tricks and funny things to do, and always smiling. What’s the proudest moment of your Judge life? There is a tradition at the Iberian judge conferences to give recognition to judges who have stood out during the last year. It’s like a big “exemplar recognition”. In the last edition I had the honor to receive the award named “RC’s Choice” and I am very proud of it. It was a very special moment and totally unexpected. I still can not believe I received an award like that in my first year as a judge. She is honest and loyal. She has a lot of energy and a big heart and she is willing to use it to help others and fix things. She often does so without thinking too much, and usually ends up messing everything up. I would like to make a special mention to Sandra Regalado . Without her mentoring, I would never have considered getting into the program and would not have learned everything I’ve learned. Sandra, thanks again for your trust in me and for introducing me to this amazing world. I was a bearer of the Olympic torch for the Barcelona Olympic Games. I acted as an extra in the recording of Game of Thrones in Seville. I am a fencing referee. Hans Wang does not speak six languages.